It is that time of the year when you typically conduct planning session with your teams. I just came from one that I facilitated a week ago. I would like to share the planning methodology that we used. This planning process that I am going to share with you is nothing new and nothing that I came up with. You can find a lot of planning methodologies out there, if you Google it. It is important to understand the current situation and needs that your organization has in a particular point in time, and then use it to tailor your planning process. It is important that your team understands the entire planning process—what it is that you are trying to accomplish and what are the expected deliverables. I usually allot an adequate portion of the planning meeting to explain the “tailored” planning methodology. 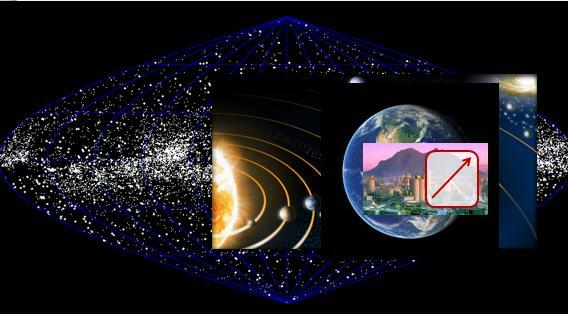 At this particular instance, I started out by showing the team the atlas of the universe; then the solar system; and then a picture of our planet earth; then I showed the a picture that represents our company or the business enterprise that we belong to; and finally, a box with an arrow going upward. I told the team, “that box represents us.” I explained why. The box represents us—our mission and vision as an organization (see diagram below). Our mission defines our purpose— what is in and what is out. It represents, in the broadest sense, who we are. The vision is where we want to be as a group in a period of time in the future. 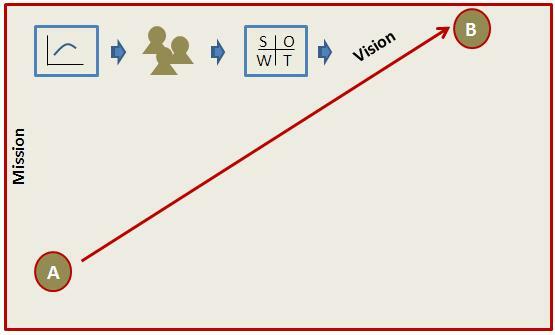 The arrow from where we are now (point a) to where we want to be (point b) represent the shortest path to achieving our vision. Our group had the opportunity to define our vision in our planning session last year, so that was something that we carried on and will carry on in the next couple more years. It is an input to this year’s planning process. It is important to know where you are at the multi-year planning cycle to best tailor your team’s planning process for that particular year. Invited key stakeholders of the company to speak to us about the business strategy, their expectations and needs. Gathered customer feedback from different forums and channels. Analyzed operative and project results from previous years. Conducted a team discussion around organizational concerns. Identified and discussed our Strengths, Weaknesses, Opportunities and Threats as a team. Established our vision for the next 4 years- articulated in a vision statement. Define our objectives and goals for the first year. All the things that we accomplished in our planning session last year were used as inputs. We also analyzed the relevancy of some of our foundational objectives. After reviewing the inputs from last year, the next thing that we did as a group was to do the “look back”. We talked about the operative and project successes from the past year. It was important to identify lessons learned and to convey key messages that align to the overall company direction and strategy. We had the team present those success stories by relating their experiences and journey. Financial – To succeed financially, how should we appear to our stakeholders? To satisfy our stakeholders and customers, at what services must we excel and what projects must we deliver? To achieve our vision how will we sustain our ability to change and improve? You believe that by improving team culture, it is going to improve service delivery. And by improving service delivery, you believe that you will have more satisfied customers. And finally with improved service delivery and improved customer satisfaction you optimize IT cost. How those objectives flow and link represents your strategy. After we defined and agreed on a strategy and with it the foundational objectives, the next step is the most tedious and difficult step of the entire planning process. It is the actual definition of departmental, team, and individual objectives. When you get to the point when you start identifying what you need to do to accomplish the strategy, real work begins. The team needs to have a clear understanding of the strategy, the role of their department/team and their individual role in making it happen. 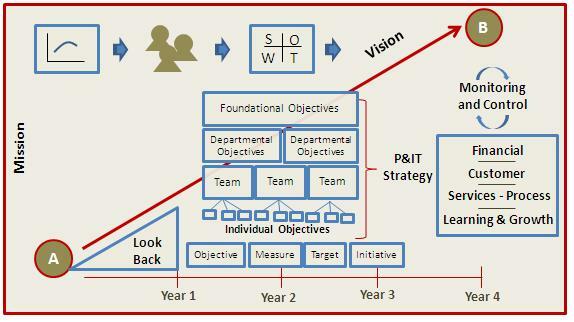 The first step is to break foundational objectives into departmental objectives. You can do this using a breakout session. 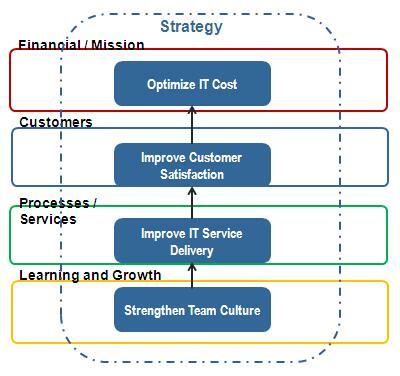 Teams within their departments identified next level objectives and initiatives that they are responsible for. It is important to identify not only the initiatives/actions but also the measure and target by which the performance of the action will be measured. In this process the common SMART method comes in handy. Your objectives have to be Specific, Measurable, Attainable, Relevant and Timely. Finally, you have your mission and vision; you have your strategy and a detailed game plan (objectives) on how to bring your goals to fruition. The next challenge is to make it happen. I believe that the planning process does not stop after the initial planning process, which to me is the annual planning meeting. It is an ongoing process throughout the year. I like to borrow a term PMI uses- “progressive elaboration”. As you go through the year, you monitor and control the execution of the plan, as well as the changes to it. As you progress through the year, you will gain more information, priorities might change, and business requirements might change– you progressively elaborate your plan aligned to the business and IT strategy. Glenn, this is an absolutely remarkable post! I know many readers will apply and adapt the approach you outline so clearly, and they will be grateful for what you have shared. As a management consultant, I led or participated in literally hundreds of business and IT (and some HR and Shared Service) strategies, and used many different methods depending on the client context, and I think you have captured many ‘best practices’. My pleasure sharing this to all. It has been awhile since my last post, I realized that miss blogging, poured it all out yesterday! I had a couple of folks asked me also about planning methodology when I posted pictures from our IT organization’s planning last week, so instead of sending individual replies, just wrote this blog for everyone. I also learned a lot from the webinar that we did together Vaughan last month. I was able to quickly incorporate some of tools in our planning. It was perfect timing. i will definitely keep this in mind and actually read it more. I am sure I will be able to use this when the need arises. amazing. thanks for your sharing it. Great to know that this can be useful. If you need more info just send me an email. I’m a fan of the balanced scorecard system for strategic planning and measuring progress. I really like the visualization of the process that this blogger posted in this article.